The popular Bowlsmaster Electronic Scoring System for Indoor Bowls is very flexible and can be built to suit your particular requirements. At the heart of every Bowlsmaster system are the rink scorers which are renowned for their reliability and ease of use. In addition to rink scorers, clubs can choose from a variety of popular additional features such as Masterboard and Totaliser Displays as well as Electronic Skips Names Displays. High quality – we pride ourselves on using the highest quality components in our scorers. This makes them reliable and long-lasting. Simplicity – using Bowlsmaster scorers couldn’t be easier. You don’t need a degree in rocket science to use it and you don’t need to connect it to a computer. Excellent value – just because you’re buying the highest quality scoring system available doesn’t mean you have to pay the earth. Helpful Customer Service – we are always at the end of the telephone if you need to speak to someone and we don’t charge a monthly service charge. We’re always happy to help and, if you do have a problem and even if you’re out of warranty, we’ll do our best to help you quickly. We have many years of experience and have installed over 150 systems across the UK with the majority of our business coming from personal recommendations which is a testament to our commitment to customer satisfaction. Additionally, we pride ourselves on our helpful customer service and aim to provide you with the most suitable and affordable electronic scoring solution tailored to your club’s needs. The Bowlsmaster scoring system for indoor bowls is modular and offers a wide range of features to choose from. Many of the Bowlsmaster modules can be retro-fitted too so, if for any reason you don’t choose a feature when you initially fit your system, you can have it added at a later date. At the heart of every Bowlsmaster scoring system are the Rink Scorers. 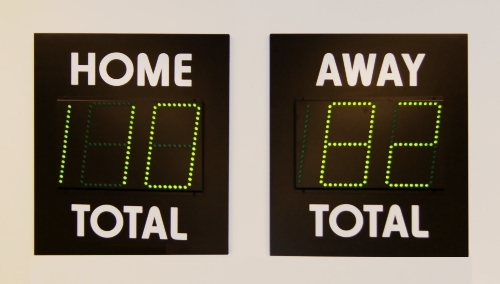 These are situated on the green at the end of each rink and display the ‘Home’, ‘Ends’ and ‘Away’ scores. Scores are entered manually during the course of the game and appear on the Rink Scorer’s big, bright LED displays. Additional Rink Scorers can be incorporated into a Bowlsmaster Electronic Scoring System to accommodate scores from away games. Bowlsmaster Totalisers calculate and display the total ‘Home’ and ‘Away’ scores from the Rink Scorers. It is possible to exclude unwanted rinks’ scores from the Totalisers. Totaliser modules can be integrated into an existing club’s masterboard, a bespoke Bowlsmaster Masterboard or supplied as standalone units. 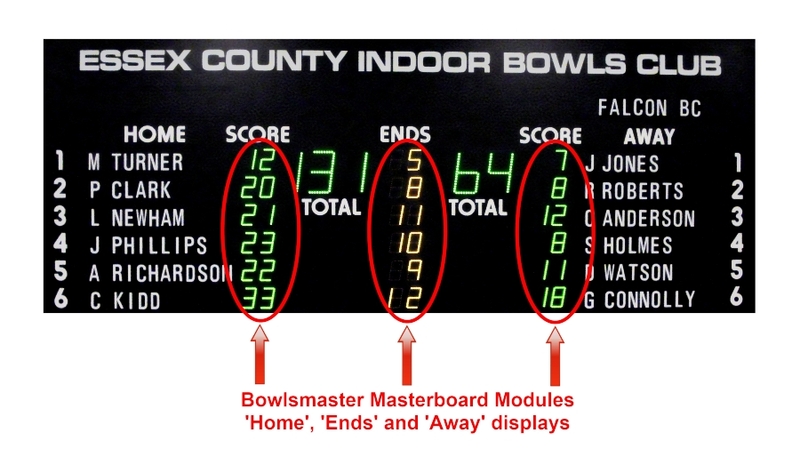 The ‘Home’, ‘Ends’ and ‘Away’ scores from the Rink Scorers can be duplicated and displayed electronically on a Bowlsmaster Masterboard, usually positioned centrally at the end of the green. This allows players and spectators to see the results from all of the games taking place at a glance. It is possible to exclude unwanted rinks’ scores appearing on the Masterboard if necessary. Bowlsmaster are able to produce and install bespoke Masterboards where integration into a club’s existing masterboard is not possible. The example shown below is a bespoke Bowlsmaster Masterboard featuring electronic ‘Home’, ‘Ends’ and ‘Away’ displays along with Totalisers. The skips’ names are displayed using the Bowlsmaster magnetic letter system. The Rink Selector feature brings further flexibility to the Bowlsmaster Electronic Scoring System. It allows you to choose which rinks’ scores are displayed on the Masterboard. In addition to this, it can also be used to enter up to 4 channels of additional rinks’ scores – ideal for away games such as Denny cups etc. This popular feature replaces the standard ‘magnetic letter’ skips names with fully electronic 12 character LED name displays. Not only do the skips like to see their names in lights but you can also use the display as an illuminated message board – you could impress the visiting team with a welcome message, for instance. As a result of the high quality 22 element displays used in the Bowlsmaster Skips Names Displays, the font is very easy on the eye. Most existing systems only use 18 elements which can lead to confusing characters which can make names and messages difficult to read. The Electronic Skips Names facility comes with a dedicated Bowlsmaster Alpha-Numeric Terminal which is very simple to use. It also makes the tiresome chore of laying out the skips names manually a thing of the past.